This article appeared in the Daily Mail and was again featured on the Marian Finnuncane Show, it seems everyone loves Holly! As far as dogs go, we’ve always been a bit of a divided house. James proudly professed himself to be ‘not a dog person.’ It’s possible that I made some small contribution to his stoic indifference of man’s best friend. 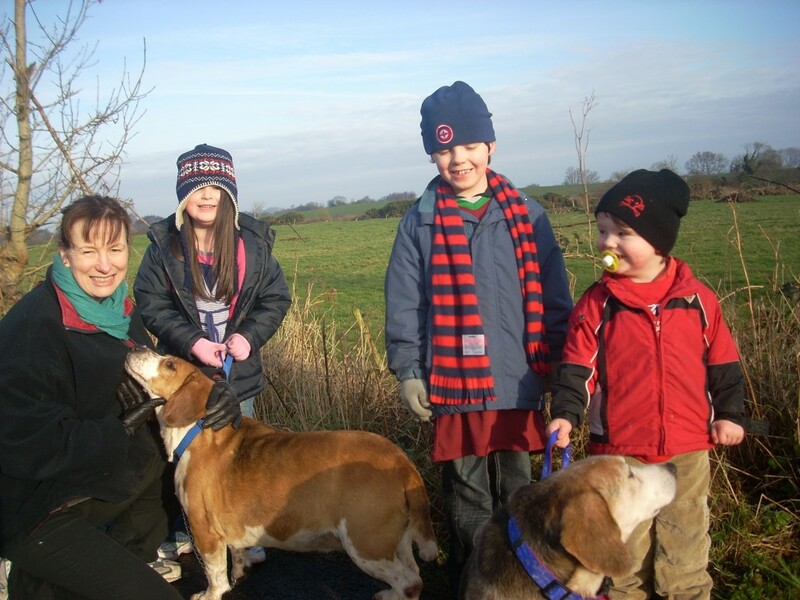 You see, when we met first I had only one baby and she was a hyperactive, mad hatter beagle called Holly. A gift from my well-meaning brother in law, Brian. She almost ate me out of house and home. I’m talking literally, she went at my little cottage one table leg at a time. Nothing was safe. Even with a doggy grill for my car – she managed to chew her way through. She made a decent start on the steering wheel, the kitchen bin was emptied regularly, shoes and jeans eaten from the radiators and I never managed to get on top of the garden – it’s not easy when you have a full grown blood hound hanging off the strimmer. Holly remained my dog. Any photographs taken of us, she’s at my side or, being Holly, looking over my shoulder. We remained a pair, even if others tried to lure her loyalty away with sweat meats and a luxury pillow bed. I think there’s a special bond that grows when it’s just the two of you and it’s heightened when you start off with a puppy. There’s no doubt that Holly broke my heart. House training her was enough to crack hardened navy seals. On the other hand, as I watched her amble into old age, I relished her newfound calm, even if she never really got any sense. She became a huge beagle, falling into obesity easily, welcoming it as a shawl loose about her. She was the kind of dog that kids stared at, truly as broad as she was long. Beagles make great pets. They have the most easygoing friendly nature. Truly, she never so much as snapped. Actually she only barked once; in the middle of the night and she nearly put the heart crossways in me. Bad dreams, it seems even beagles have them. Old age slowed her down, crept up on her as surely as the tide leaving the beach. All at once, she couldn’t run but pant, couldn’t jump but fall and her tail thumped the ground more often than it sliced the air. In the final weeks, she lay mostly in her basket by the fire, punctuated by walks that rarely ventured beyond the gate. The vet shook his head, sadly. He’s seen death often, but I suppose, a personality like Holly, drifting off with ever cloudier eyes would move even the most battle weary. He could put her to sleep, or we could let go peacefully, I chose the latter, stocked up on painkillers, we organised a vigil in the end. She waited until it was my watch, greeted me with those bloodshot eyes, her tail wrapped lethargically around her body. It seemed that there was a bleached out quality to her, everything about her faded; from her coat to her vitality. In the end, her every breath was a tired sigh, but she raised her head to greet me, we were still in this together. She passed away quietly, with just the ticking of the clock on the mantle above our heads. I rubbed her soft ears until I knew there was no part of her with me anymore. The thing about a dog like Holly is you can’t replace her – which I suppose was a huge relief to James. It took three years before I felt ready to think about getting another dog. But then, it became like an urge, I could see all the reasons why – unfortunately, Mr H could see all the reasons why not! Just before Christmas last year, poor Norris (super cat – the treaty family pet) took on a speeding car that he was never going to beat. To say the kids would be devastated was an understatement; in a moment of extreme weakness, I seized my opportunity. (James was in bits at the thought of our lovely cat at an end too soon – they’d become great buddies after James relinquished his favourite sofa end to Norris.) ‘A small dog, something to fill the gap, leave it with me,’ I said. I hit every dog refuge within the next few hours. I knew exactly what I was looking for. It must have been a busy week because all I seemed to turn up was huskies, greyhounds or little white things that would be a tripping hazard for everyone in our house. By five o’clock, I had the car filled with children, money in my wallet and a rough idea that I was headed half way across the country. I’m not so sure that even when I had set off, James realised that it was really happening, neither did the kids, not really. 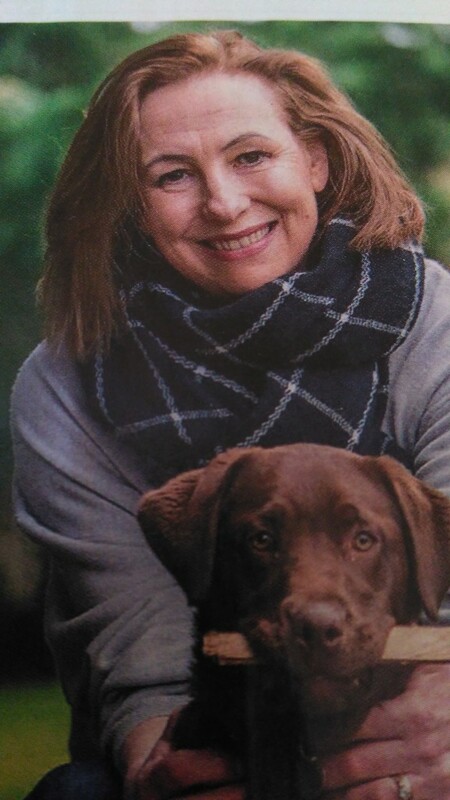 I was a woman on a mission – this was Mission Penny, a chocolate brown lab puppy who has managed to conquer everyone’s heart – whether they will admit it or not! And for those of you who never met the legend that was Holly…. she’s the larger lady, on the left – big ears, you really can’t miss her!